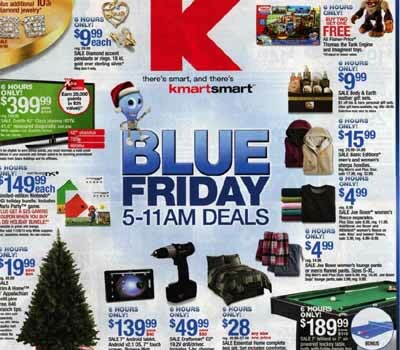 Black Friday 2010 Deals at Walmart, Kmart, Best Buy and Target! As everyone knows Black Friday is the biggest shopping day of the year so we wanted to update you on some of the great deals you can get if you’re willing to wait in line or get to the online stores at the time of the deals. Walmart and Target are two of the biggest advertisers during Black Friday. Black Friday Deals at Walmart begin at 5am this Friday, and Video Game, Toys, Apparel and Home deals begin at midnight at some locations. Go to Walmart.com, enter your zip code and find the best deals at your local stores. All Walmart specials can be seen here. Best Buy has a great Samsung 58″ Plasma HDTV (PN58C500) selling for $1197.99. Target is having a 4 day Pre-Black Friday Sale from November 21st through Wednesday, November 24th. These deals will be very similar to Black Friday’s deals and you can claim them both online (at Target.com) and in any of their locations. Kmart is advertising a great deal for free shipping if you buy online and spend more than $60. The coupon code is KMSANTA so be sure to check online before waiting in line at the stores. If they have your item on their site, it will save you time to buy it that way. If you need the items the same day, Kmart allows you to purchase items online and then pick them up same day at a location near you.